The national platform for design took place last weekend, embracing Sri Lanka’s new identity as South Asia’s creative hub. 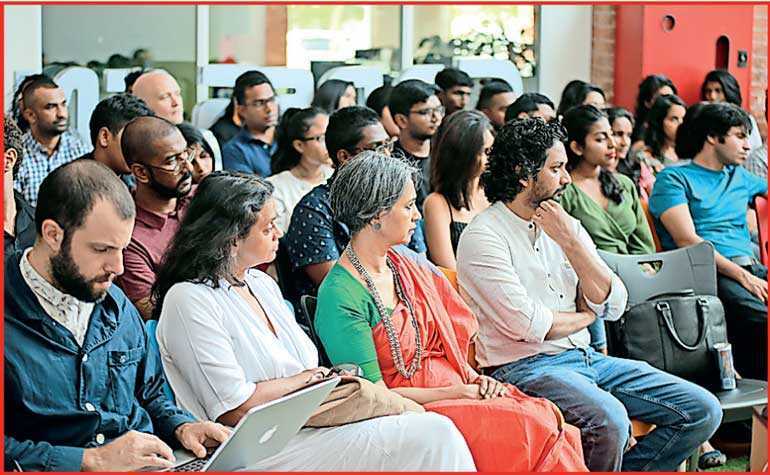 This edition of the festival had a special significance for all of Sri Lanka, as it became the centre for the discussions shaping the country’s very first national policy for a creative economy, held in collaboration with the British Council and Netherlands’ Embassy of Colombo. The festival was open to Sri Lankan businesses, designers and the general public, to walk in free and engage with thought-provoking discussions on how design is impacting our everyday lives, and experiences built on creativity, technology and lifestyles. Sri Lanka Design Festival 2018—‘Innovation Island Edition’ was a fantastic merger of ground-breaking creative thinking, design talent and sustainable work philosophies with brands and people innovating at the frontiers of diverse sectors from architecture to typography. For the Sri Lankan creative community, it was a hotbed of international design connections, new ideas and like-minded collaborators from across the globe; meanwhile for international visitors, it portrayed how Sri Lanka’s growing creative ecosystem is evolving, and where they can form collaborations in this South Asian hub for design and innovation. Sri Lanka Design Festival was organised by the primary design catalyst in the island—AOD—in partnership with the EDB, Wijeya Newspapers, Widac Steelcase, Basix, CodeGen, WSO2, Calcey, Orange Electric, Trace Expert City and SLTC. Sri Lanka Design Festival (SLDF) was brought to life at the Trace Expert City in Colombo—transforming the tech hub into an inspiring mini metropolis of design. The event presented a progressive new vision for Sri Lankan creativity, through a series of design exhibitions and curated experiences building novel sensory immersions upon businesses using creativity, installations that are fascinating mergers between lifestyle and tech, as well as design thinking talks and knowledge-sharing forums dedicated to exploring where enterprise and innovation meet. The event attracted the participation of the local design community and a carefully selected delegation of innovators, creators and design thinkers from around the world. A creative economy needs a strong culture underpinning it, in order to thrive. This is what SLDF’s international partners from British Council and Netherlands Embassy also noted during the conferences and open forums discussing the measures for facilitating a healthy creative economy in the island. Forming collaborations with a number of unusual design thinkers, innovation driven brands and initiatives, SLDF created a fantastic portrayal of Sri Lanka’s creative cluster throughout the festival. A curated exhibition of Steelcase Smart Furniture designed to enhance workspaces through ergonomics, was portrayed as the WIdac-Steelcase installation where design and bioscience converged. Meanwhile, Calcey Technologies conducted a demonstration of SitRight smart seat cover with embedded sensors that monitor and correct sitting posture to fight back pain caused by prolonged sitting: it also presented how a smartphone app can bring in intuitive coaching and visualisations of your progress over time, depicting behavioural change via real-time feedback, with active posture support. Meanwhile, the Eco-Brick installation designed and created by AOD’s interior design students, using eco-bricks developed by CSR Lanka, consisting of recycled PET bottles. Portraying how design penetrated everyday life, SLDF also brought in lifestyle practices, ideas and consumer cultures that are centred around design. Sustainable café and exhibition featured showcases on conscious homeware and textiles from Design For Sustainable Development (DFSD), sustainable alternatives for packaging and vendors with organic food including Eat Right, Brown Bean Coffee, GamiGedara, Chesma’s Natural Cookies, and Trace Expert City’s resident food vendors Currymuch. SLDF’s sustainable exhibition also included curated mini-versions of Colombo Design Market and the Good Market. Innovation island’s most ground-breaking creative perspectives were brought to life at SLDF’s ‘Design Katha’ conference. The talk series unpacked new knowledge on topics connected to the dynamics of design and space, where creativity meets the natural world, architecture and environmentalism, ethical products and services, as well as typography and culture. Co-curated by AOD and Artra magazine, the forum brought together an inspiring mix of innovative thinkers exploring design through a multitude of industries. ‘Dynamics of the modern workplace’ panel discussion explored the shift in prioritising the wellbeing of individuals and the environment at workplaces, and how design becomes the process to achieve this balance, with a panel including AditiAmalean—the Founder of Catalyst Cowork of MAS Holdings, Iain Smales—Designer from Co.Design, SajaniAmarasiri—Founder of Colombo Cooperative and Poornima Wijendra—the wellness expert. It was moderated by James Balmond—Director of Balmond Studio Colombo. A session titled ‘Creators’ engagement with the natural world’ was led by Azara Jaleel—Editor of Artra magazine and the Curator of Daily Artra, with Saskia Fernando—Gallerist and Director of Saskia Fernando Gallery and Founder of Art Space Sri Lanka, Lalith Manage—Co-Director of Theertha International Artists’ Collective and Poornima Jayasinghe—Co-Founder and a Director of the Collective of Contemporary Artists (CoCA). ‘Exploring the role of architecture in promoting environmentalism’ was highlighted by an impressive panel including Ruchi D.Jeyanathan—Architect at The Contemporary Design Studio, John Balmond—Architect, and Managing Director at the Balmond Studio, Sunela Jayewardene—Principal Partner at Environmental Design and Kjell Van Doren—CEO of MVIVO. ‘The progress of ethical products and practices in Sri Lanka’ was a session that explored how sustainable design, practices and approaches are reshaping Sri Lanka’s leading industries; the discussion was led by Savera Weerasinghe—CEO of AnantaSustainables, with Hugo Kaemfer—Co-Founder of Parkville and Dr. Amanda Kiessel—Co-Founder and Director of Good Market. A project that used the power of design in an ingenious manner to use historic knowledge for modern purposes and strengthen diplomatic ties was showcased with the session ‘Reviving the original Sri Lankan fonts created by the Dutch Press’ by the Project Founder and Typographic Designer PathumEgodawatta, Netherlands Ambassador for Sri Lanka—Joanne Doornewaard, Dutch Typeface Designer Martin Majoor and Dr. Sumanthri Samarawickrama, moderated by AOD’s Senior Faculty Member in Visual Communication Design, Alain Parizeau. The event also hosted a special edition of the Colombo ‘Ladies, Wine and Design’ movement. 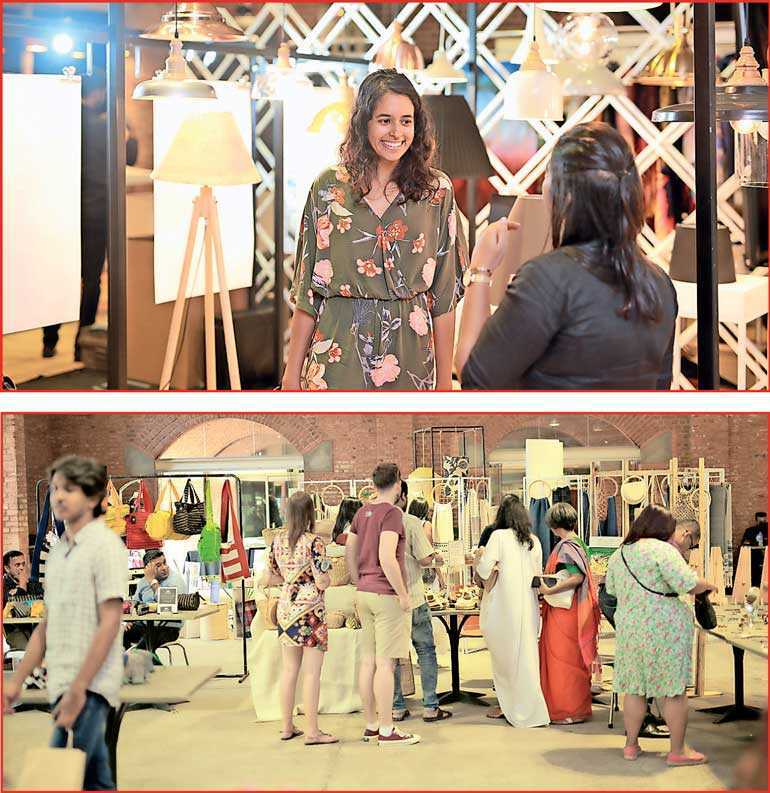 The annual showcase of AOD’s graduating designers from visual communication design, interior design, motion graphic design and animation, as well as fashion—REVEAL— was also held as part of Sri Lanka Design Festival’s ‘Innovation Island’ edition. In this vision, AOD’s REVEAL Graduate Design Showcase was the essential portrayal of Sri Lanka’s next generation of professional designers who will supercharge the ‘Innovation Island’ with their fresh energy. The exhibition was attended by an impressive delegation of international brands, labels, entrepreneurs and businesses linked to design and innovation. Simultaneously, leading names in a wide cross-section of Sri Lankan industries like advertising, publishing, product exports, apparel, hospitality, homeware, architecture and interior design were also part of the especially invited audience at the REVEAL graduate design showcase. The graduate design showcase also became a fantastic opportunity for the young designers to form useful networks with local businesses, potential employers and the international world of design. Some of the other highlights of the festival were the ‘Creative Economies Policy Forum’ hosted in partnership with the British Council Colombo, ‘Design Thinking Forum’ and ‘Knowledge Exchange Roundtable’ hosted in collaboration with the Netherlands’ Embassy, and the ‘Circular Design Workshop’ by the Dutch project CIRCO. Sri Lanka Design Festival formed an important stage in the ‘Innovation Island’ vision for Sri Lanka’s creative economy, presenting new opportunities, possibilities and pathways for the local creative industries. SLDF was presented by AOD and supported by the Kingdom of the NetherlandsEmbassy Colombo, British Council, Wijeya Newspapers, Trace Expert City, SLTC, Widac Steelcase, CodeGen, WSO2, Calcey, Sit Right, Orange Electric, Balmond Studio, AnantaSustainables, the Good Market, Colombo Design Market, Artra Magazine, We Are Designers, Kings Co., Urban Island and Fashion Market.lk.